« My First Christmas Card of the Season! Love Birds that are JustRite! 2-I added a couple of my own challenges-NO white, Not too feminine but elegant! 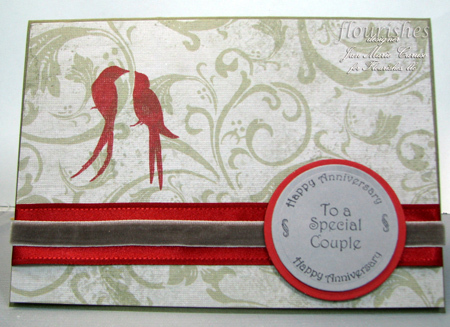 3-I wanted a special card for an anniversary for a special couple. Now how to put all of the thoughts together in a pleasing card? Yes, I had set a challenge for myself, had I worked myself into a self made box. I could see a romantic, yet elegant but not too fussy, man friendly card. The colors were OK, well maybe a little drab, but I certainly could spice them up…that new Riding Hood Red is beautiful. The Grey and Green…OK good men’s colors. Now for my need of romantic image, but not too smaltschy….hum let me look at all the Flourishes images….there must be just the right thing. Lace Heart is great, but not for this card, no flowers, nothing sketchy today, I need a strong image. OH, I just had a brain storm, those wonderful new birds for the Birds in Vine may just be the answer. But these birds will need my focal image and I don’t want to use white paper–another part of my self imposed challenge. I selected two birds that look like they could be mates. I position and reposition, stamped color on color and cut them out. Not quite the look I had in mind. I finally have positioned the two images in what I think is the perfect position and stamp in on my scrap paper. Yes, these birds are right what I was looking for….Love Birds. So now I need just the right paper or image to work with as a background. I tried the Harlequin set with hearts…nice but not for today. I pulled out some of my vast stash of background paper (yes, I think I am a paper hoarder). Low and behold there is a wonderful background paper that I think will be the perfect setting for my birds…the color and texture are grand, elegant but not too much for the hubby. But I still need a way to tie this all together…more looking. The another light goes on in my head….didn’t we just get the new JustRite items in yesterday here at Flourishes. Now just imagine me making a mad dash to the shipping room and going thought the boxes. AH HA, here is just what I had remembered from CHA….the JustRite Wedding Ensemble and it does have a great sentiment for anniversaries! Sweet! While I am in the shipping room I pulled out some wonderful ribbons to use. A great dark red satin and Grey Velvet. I am set. Now to put the pieces together. The hardest part was actually stamping the couple of birds directly onto the beautiful background paper. What if it wasn’t right? Then I’m having the conversation with myself…”It is just a piece of paper, please just get on with it” So I take the plunge. I am glad I did. I think I will just darken up the image, to make them a little bolder, so using my blender pen I picked the ink form the pad and carefully intensified their color. Pleasing to me. On to the next step. I am keeping the rest of this card simple. Always Artichoke is the base card, no corner treatments. A simple straight line of ribbons stacked on each other. Again, I am pleased with the look. The sentiment is stamped on the Going Grey with Basic Grey, cut our with a circle Nestabilities (couldn’t live without the basics!) It still just needs a little humph so I cut a second circle this time a size larger and in the Riding Hood Red paper and stacked. Layer and attach some larger glue dots on and set off to the right to balance my asymmetrical placement of the birds. I hope you enjoyed my ramblings on the card making as this was a journey today. A different approach to sharing my thoughts and actions. I am so glad you took the time to visit the Atelier and look over my shoulder. Do come back please, and go ahead invite a friend or two to visit as well. I have saved the best for last today…Blog Candy! I have a JustRite shirt to give away and will pick a winner on Sunday night Sept 21st. Leave a comment on the cards journey here at the Atelier. Some one will be the lucky winner. Visit Flourishes webstore and check out the new JustRite items we have received. We have a good but limited supply so shop early for your choices. What a lovely wedding card. Those birds just pop off the page. I don’t have any weddings coming up, but that wedding set is really nice. Beautiful card! I love the elegance and simplicity. I loved the ‘ramblings’. Your personal thought process behind the card was so interesting. I did love your “please, just get on with it”, oh boy is that me too. It’s turned out a great card, I’m sure they will love it. What insight. At least you listen to yourself. I loved hearing how your card came about. It is a wonderful card. Not a bit too feminine but still romantic. Oh and thanks for the chance at the JustRite stamper. Its on my wish list so maybe my wish will come true.